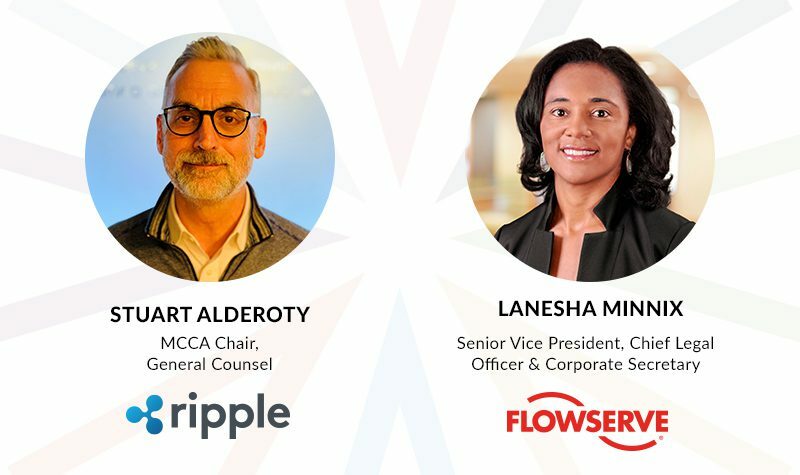 Washington, D.C. – The Minority Corporate Counsel Association (MCCA) announced today the appointment of Stuart Alderoty, General Counsel of Ripple Labs, as Board Chair and Lanesha Minnix, Senior Vice President, Chief Legal Officer & Corporate Secretary of Flowserve Corporation, as a new member to its board of directors. Their appointments are effective immediately. Stuart Alderoty has served in his current position at Ripple, a provider of leading enterprise blockchain solutions for global payments, since January 2019, where he oversees all legal services and manages the company’s global legal, policy and Bank Secrecy Act compliance teams. Alderoty brings more than 30 years of legal experience to the role with expertise in financial services and regulatory affairs. He was previously executive vice president, general counsel and corporate secretary for leading financial institution, CIT. Prior to CIT, Alderoty was executive vice president and general counsel for HSBC North America. Alderoty was also managing counsel at American Express, where he served on the leadership team of the President and CEO of American Express’ Consumer Card Business. Alderoty began his career in private practice and was a partner with the international law firm of LeBouef, Lamb, Greene and MacRae, where he specialized in litigation. Lanesha Minnix is currently the senior vice president and chief legal officer at Flowserve, one of the world’s leading providers of fluid motion and control products and services. She is responsible for all of the Company’s global legal and compliance matters with operations in more than 55 countries. Prior to joining Flowserve in June 2018. Minnix served as senior vice president, general counsel for BMC Stock Holdings, Inc. Minnix was also vice president, deputy general counsel and chief compliance officer for ABM Industries Incorporated. Minnix also held roles with increasing responsibility at both Royal Dutch Shell/Shell Oil Company and Sprint Corporation. Minnix began her career as a corporate associate at the law firm of K&L Gates. With the appointment of Alderoty and Minnix, MCCA’s Board of Directors consists of 17 members: Stuart Alderoty, General Counsel, Ripple Labs, MCCA Board Chair; Jean Lee, President and CEO, MCCA; Ricardo Anzaldua, Executive Vice President, General Counsel & Corporate Secretary, Freddie Mac; Damien Atkins, Senior Vice President, General Counsel & Secretary, Hershey; Craig B. Glidden, Executive Vice President & General Counsel, General Motors; Kirkland Hicks, Former Executive Vice President & General Counsel, Lincoln Financial Group; Duane Holloway, Senior Vice President, General Counsel, Chief Ethics & Compliance Officer and Corporate Secretary, United States Steel Corporation; Sandra Leung, Executive Vice President & General Counsel, Bristol Meyers Squibb; Linda Lu, Senior Vice President, Property & Casualty Legal Personal Lines, Nationwide; Suzan A. Miller, Former Corporate Vice President, Deputy General Counsel & Corporate Secretary, Intel Corporation; Lanesha Minnix, Senior Vice President, Chief Legal Officer & Corporate Secretary, Flowserve; Samuel M. Reeves, Senior Vice President, General Counsel, Walmart International Legal, Walmart; Robin Sangston, Vice President, Chief Compliance & Privacy Officer, Cox Communications; Dawn Smith, President & Chief Operating Officer, Cologix; Richard J. Wallis, Former Vice President & Deputy General Counsel, Microsoft; Neil Wilcox, Senior Vice President & General Counsel, Enterprise Shared Services, USAA; and Simone Wu, Senior Vice President, General Counsel, Corporate Secretary & External Affairs, Choice Hotels. Former MCCA Board Chair, A.B. Cruz, III, Former Senior Vice President, Enterprise Shared Services, Chief Legal Office, USAA, will serve on MCCA’s Board of Advisors. The Minority Corporate Counsel Association was founded in 1997 with a vision of making the next generation of legal leaders as diverse as the world we live in. From publishing research insights to providing professional development opportunities to offering advisory services, today MCCA is the preeminent voice on diversity, inclusion and equity in the legal industry. MCCA empowers members with the tools needed to disrupt business as usual – and to blaze a path forward for their company, industry and corporate America.